MARCH 24, 2016 UPDATE: Terrence Cody was sentenced today to nine months in the Baltimore County Detention Center. “Deflate-Gate” isn’t the only major NFL story today. 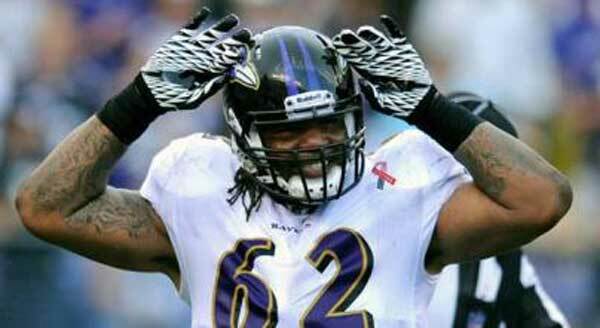 Baltimore Ravens nose tackle Terrence Cody, who is currently being investigated for animal cruelty, will be dropped from the team after the Super Bowl. The official Ravens announcement today made no mention of the investigation by the Baltimore County State’s attorney’s office, however. According to Cody’s agent, Peter Schaffer, Cody paid $8,000 for a Bullmastiff from Spain. When the dog became seriously ill, Cody took him to a vet. Schaffer said the dog died from worms. He didn’t mention what kind of worms the dog had or the duration of the dog’s illness before Cody sought treatment. No further details about the investigation have been released. The “atmosphere of hysteria” is in reference to the NFL’s toughened-up personal conduct policy, which followed last year’s suspension of another Ravens team member, running back Ray Rice. In that domestic abuse case, an elevator camera captured Rice punching his fiancée in the face, knocking her unconscious. Rice later won his appeal of the suspension and it was overturned. Yesterday the NFL Players Association filed a grievance against the NFL to challenge the new personal conduct policy, ESPN reports. No charges have been filed yet against Cody. “If I find out that anyone holds anything against my client because of this, I will take every and all legal action to make sure my client’s rights are vindicated and that he’s made whole,” Schaffer told the Baltimore Sun. Back when he was still whole, in March 2013, dog dad Cody announced on Twitter that he was selling one of his 5-month-old Presa Canario pups for $4,000.